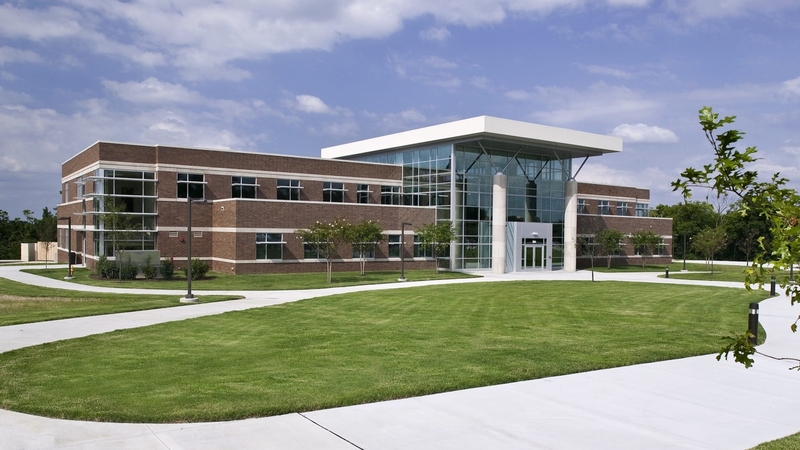 The project is a new 35,000 GSF, $8.0 million academic building for Motlow State Community College (MSCC) that serves as a center for the Smyrna campus and houses classrooms, faculty offices, and three science labs. In total, there are six “standard” classrooms, two distant learning (“ITV”) classrooms, three computer labs, teaching labs and support spaces, and a clinical nursing training lab. In addition to the classrooms, there are twenty faculty offices, two adjunct faculty offices, two student lounges, and a student orientation/consultation area. MSCC added 11.5 acres of property to their existing 14-acre campus. With the additional land, TMP developed a master plan that transformed the campus into a pedestrian friendly, park-like setting. Vehicular and pedestrian traffic were segregated by utilizing a landscape buffer between the buildings, parking lots, and drives. A central landscaped lawn or “campus green” was created to emulate a traditional college campus environment. A central 2.5-story lobby and monumental stair serves as the focal point and organizing element. Immediately adjacent to the lobby are the Student Success Center and student lounge. An on-site geothermal heating and cooling system reduces operational costs compared with traditional rooftop mechanical units. Architecturally this strategy reduced the number mechanical chases, leading to a smaller footprint and eliminating unsightly clutter on the roof. Glass-enclosed stairwells located at each end of the main corridor providing natural light and a visibly secure environment.